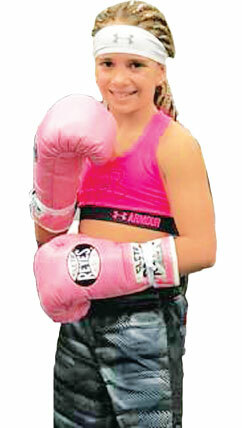 Nicknamed the “Pink Panther” due to the colour of her boxing outfit, the undefeated nine-year-old’s lightning-fast punches have won her a total of nine fights - half of them against boys in an older age category. Her deadly shots and quick footwork were honed with the help of her father and coach Artem Makogonenko. Little Kira, from Kharkov, Ukraine, has only been in training for one year, but wowed audiences online with videos of her shadow sparring with her dad while blindfolded. Outside the ring her training and skills have also helped her defend herself against bullies at school. Kira added, “I have participated in nine fights and won all of them. Five of them were with boys and three with girls. The first fight was with a boy. Artem, 33, trains with his prodigy five hours a day, five days a week to make sure her techniques is up to scratch. Artem said, “She first entered into the boxing hall slightly over a year ago and straight away started showing great results. In just one month of training she was achieving results other children couldn’t in one or two years of training.”The trainer has been showing his daughter videos of boxing legends, including her heroes Vasyl Lomachenko and Roy Jones, for her to imitate. Although there are concerns about boxing being a violent sport, Kira’s mum Irina stands by her daughter’s choice - even if it makes her fearful at times.